During affected dates and times in the Royal Oak and Edmonds area, Expo Line trains will use one track in both directions at Royal Oak and Edmonds stations. Expo Line trains will operate between Waterfront and King George stations. Crews install a 60-foot section of curved rail near Main Street–Science World Station back in May 2017. Are you planning to take the SkyTrain’s Expo Line between 11:30 p.m. 10:30 p.m. on Saturday, September 23 through 3 p.m. on Sunday, September 24? Please plan for an additional 15–20 minutes of travel time as service will be modified for rail replacement work. **UPDATE May 8** – Work has been postponed until May 22, 2017. Continue to check translink.ca/alerts for the latest updates. The Running Rail Replacement Project continues with work that started on Sunday, April 30. As part of this project we have already replaced 6851 rail pads, and expect to install a total of almost 7000 rail pads by the end of the project. Single tracking – when trains travel on the same track in alternating directions – will happen at Royal Oak and Edmonds stations from 9:30 p.m. until the end of service. 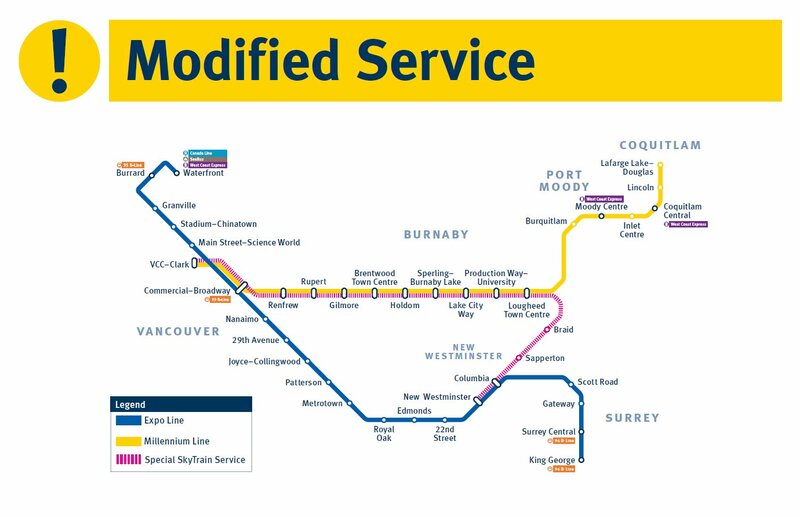 Expo service to Sapperton, Braid, Lougheed Town Centre and Production Way–University will be replaced with trains operating between New Westminster and VCC–Clark. Passengers from other stations on the Expo Line can change trains to this service at Commercial – Broadway, New Westminster and Columbia stations. **UPDATE** Work has finished early on this phase of the Running Rail Replacement Project. There will be no modifications to service on Tuesday April 11th. The Running Rail Replacement Project marches on with work taking place on Monday, April 10 and Tuesday, April 11 near Metrotown Station. 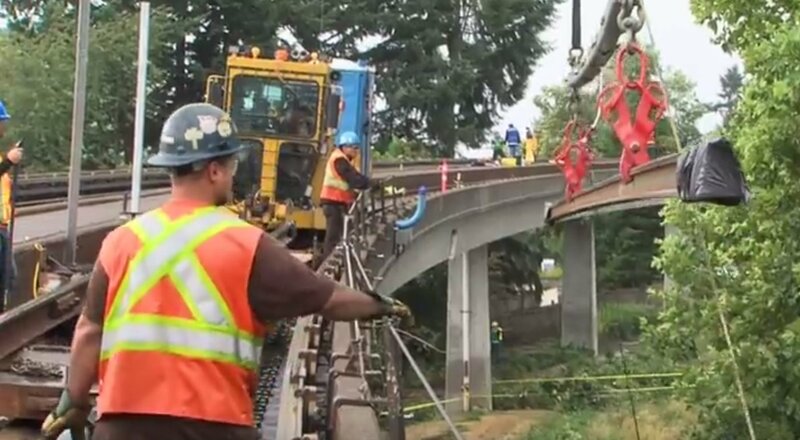 The modified service for this work will similar to the current modified service, but the single tracking – when trains travel on the same track in alternating directions – will happen at Royal Oak and Edmonds stations. **UPDATE** Due to snow and ice, this work for February 5 to February 8 is cancelled. Work is set to begin on February 13 if weather permits. An important part of delivering transit service to the region is keeping our system in a good state of repair. Sometimes that means rewiring trolley wires, station upgrades, bus refurbishments, rail work or a variety of other necessary maintenance projects. The Running Rail Replacement Project on the Expo Line will begin on February 5 to February 8 and February 13 to February 15 starting at 9:30 p.m. as part of the SkyTrain Rail Asset State of Good Repair Program. So far, we’ve replaced 15,013 linear metres of running rail! During this phase, we will be replacing 5,000 linear metres of running rail at four main locations close to Metrotown, Main Street–Science World, Stadium–Chinatown and Waterfront stations. Due to the complex nature of scheduling this required maintenance project, we will complete this work in various phases at each location. In order to complete this work, single tracking will occur around where the work is being done. 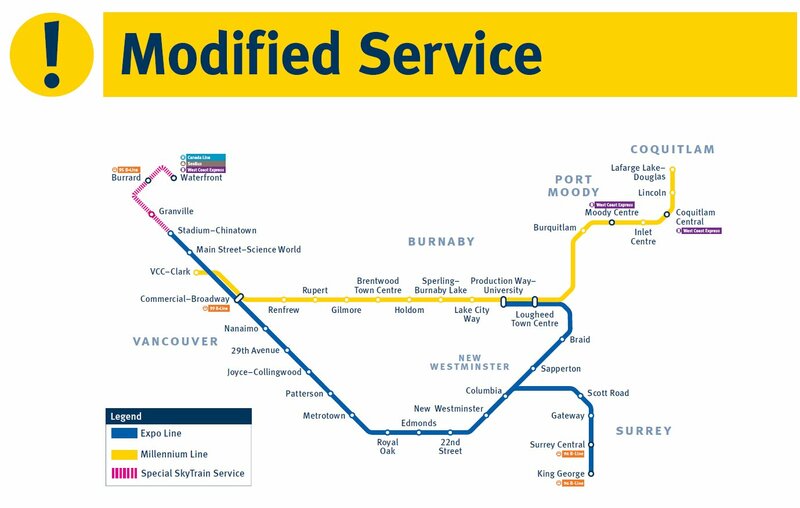 To help customers get where they need to go during this time, SkyTrain will also be slightly modified. From 9:30 p.m. until the end of service, Expo Line trains will be single tracking (trains travel on the same track in alternating directions) at Main Street–Science World and Commercial–Broadway stations. During this time Expo Line trains will only operate between Waterfront and King George stations. There will be no Expo Line trains to Production Way–University. 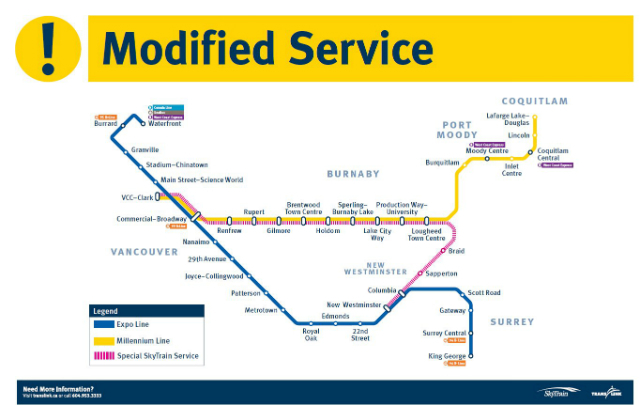 Expo Line trains between Columbia and Production Way–University stations will be temporarily replaced with Special SkyTrain Service trains operating between New Westminster and VCC–Clark stations. Passengers from other stations on the Expo Line can change trains to this service at New Westminster and Columbia stations. We will provide more specific information on upcoming work and how this may impact your travel as the project continues into June 2017. **PLEASE NOTE** This work is weather dependent. Please check the Alerts page for updates. Thank you for your patience as we work to keep the Expo Line safe and reliable for years to come. For more information on the Running Rail Replacement Project visit On Track. Updates to single tracking will be posted to Transit Alerts. 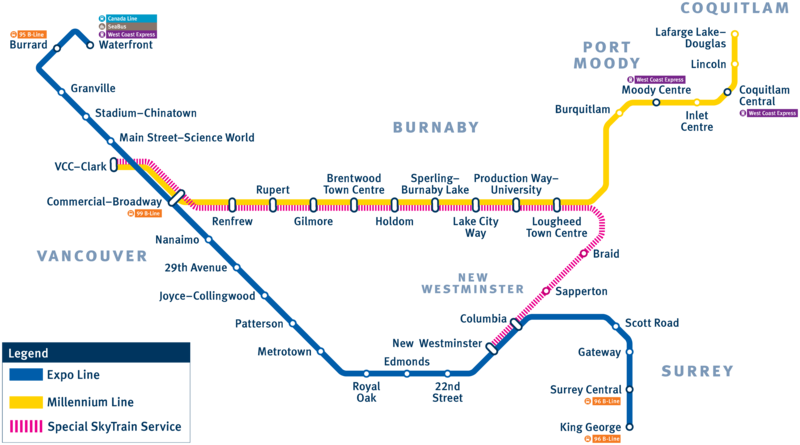 Beginning June 12 and continuing into the fall, SkyTrain will single track at several stations, primarily during late night hours, due to maintenance work and system upgrades. Riders should plan on up to 20 minutes of extra travel time during these single tracking events. Need a refresher as to what single tracking is and why its needed? In fact, many railways operate this way where they do not have two tracks to use. We use single tracking to give crews time to perform necessary work on one track while we keep the other track open for service. Work has been scheduled to avoid large events, such as concerts, sporting events and community celebrations. You can learn lots more about single tracking from our interview with BCRTC last fall. Thank you for your patience while we perform upgrades and important maintenance work to the system. or call Transit Information and Customer Feedback at 604-953-3333.